The story of the Kamel Bourgass terror trial can be viewed as an interpretation of one thing: The man's poison notes. If you believed authorities, than a terrorist conspiracy was foiled and a jury left off co-conspirators who would have to be carefully watched by the government. It was a demonstration that terror trials were too complicated, that the tools and mechanisms of contemporary democratic justice are insufficient in the war on terror. If authorities were believable, than police informer Mohamed Meguerba had laid it all out from an Algerian jail cell. Kamel Bourgass was the point man in a plot to make poison and the apartment in Wood Green as of January 2003 was a working ricin factory, the police arriving too late to secure skin cream jars full of it. It was immaterial that a field test for ricin had proved to be a false positive at Porton Down. Bourgass had been trained by al Qaida and the ricin had already left the building. A lack of evidence only confirmed that a ricin plot had been semi-successful. This was the card the British government played in reframing the trial in the press. As was superbly explained to National Security Notes by a reporter for a very big British newspaper, the London metropolitan police commissioner, eager to share his views on the trial's supposed smashing of the UK ricin terror ring, had come around to have lunch with the editor. The tale was spun out and, as consequence, no one at the paper "[had] much appetite" for a skeptical view. The real story did not, however, go down without a fight. A few news organizations did publish critical analyses. The Canadian Broadcasting System wrote that Gareth Pierce, the organizing lawyer for the defense "was convinced the evidence obtained from Meguerba ... was obtained by torture." Other newspapers either echoed it or added that those in Algerian prison are known to be tortured. So while Meguerba was never brought as a witness during the legitimate process, there was no obstacle to portraying his claim that Bourgass and co-defendants were part of a ricin terror ring in the news as if it was an entirely valid part of the case. "The jury aquitted all four," wrote Don Murray for the CBC. "It made no difference to the media coverage or to the comments from senior politicians,"
In fashioning the news, Peter Clarke, the Metropolitan police deputy assistant commissioner in charge of anti-terrorism, delivered a particularly inflammatory statement to the media. "The impact on the public, if he [Kamel Bourgass] had succeeded in what he wanted to do, is incalculable," said Clarke in a statement. And in multiple stories on April 13, one quote from lead prosecutor Nigel Sweeney stood out. Of the Bourgass notes, "These were no playtime recipes ... These are recipes that experts give credence to and experiments show work. They are scientifically viable and potentially deadly," he claimed during the trial. The power of such statements lies in the level of gullibility in those receiving it coupled with the majority never actually seeing the notes. And so now GlobalSecurity.Org will show the UK government's translations of Kamel Bourgass's notes. First up, "In the Name of God the Merciful the Compassionate, the recipe of "cyanide poison" seized in the apartment at Wood Green. Its primary method is the boiling of ground apple seeds, thousands and thousands and thousands of apple seeds. Although the recipe itself shows no knowledge of it, what it purports to go after is the cyanide in amygdalin, a complex molecule with a CN moiety, found in many plants that are part of the food chain. Crushing seeds or leaves of amygdalin containing plants, or the digestion of them, releases very small amounts of cyanide. And upon this fact the Laetrile industry was built, the belief that cancer can be cured by eating amygdalin. One health food store on the Internet sells a pound of apricot kernels for twelve dollars, others sell books on cooking and self-medicating with amygdalin. The nut, literally, of the matter is that the alleged terrorist's isolation of cyanide from amygdalin-containing apple seeds for the purposes of poisoning is a fool's errand. There's not enough of it. Another interesting facet of the Bourgass notes on ricin is that the simple chemical equation --- HCl + KCN -----> HCN + KCl --- labeled one part of a worldwide terrorist poison ring. 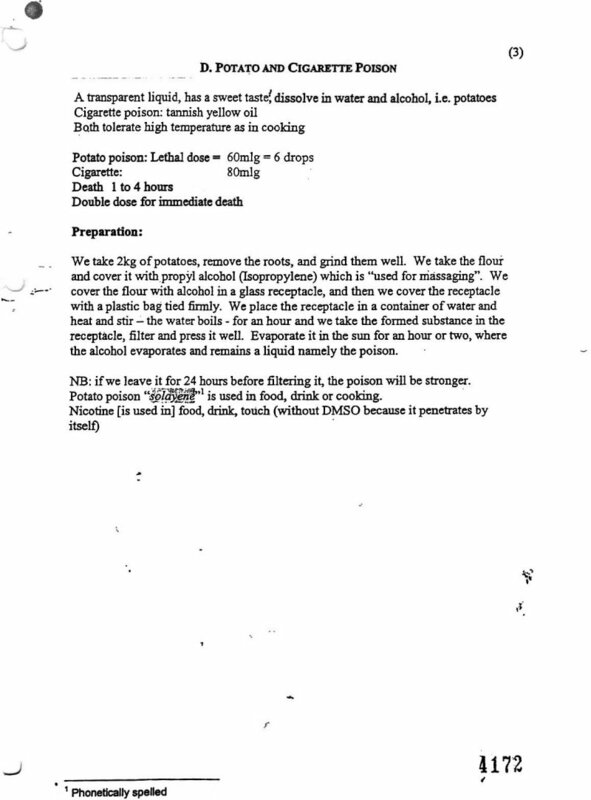 Another of the "playtime recipes" seized at Wood Green was "rotten meat poison." It addresses botulinum although the author of it has no apparent real knowledge of the subject. Summarizing: Produce a homemade tool for killing 80,000 people by throwing corn flour, meat, dung and dust together in a can. Stop laughing. Attached to "rotten meat poison" is the central recipe for ricin, "castor oil seed poison." Much discussed previously, it provides ricin in the sense that castor seeds have ricin in them, and that if you grind them and wash them with acetone, some of the ricin will still be active in the leftovers. If followed, it would produce as product degreased castor meal. One use of castor meal is/was fertilizer. Numerous university websites show its nitrogen/potassium profile for comparative use with other fertilizers in organic gardening. Decades ago, it was also used in insect control. "Attempts to eradicate [mole crickets] from turf ... by the use of arsenate of lead, ground tobacco stems and castor meal have not been successful in several localities this fall," writes the United States Golf Association Green Section glumly in "Timely Turf Topics," published November of 1941. And, of course, there is reference to DMSO, dimethyl sulfoxide. Why? Again, this is a suggestion that passes from the fringe American literature in the Eighties into the current terror literature. Dissolve your poisons in DMSO. DMSO features in some such recipes because Maxwell Hutchkinson, the author of "The Poisoner's Handbook," MADE IT UP in 1988. 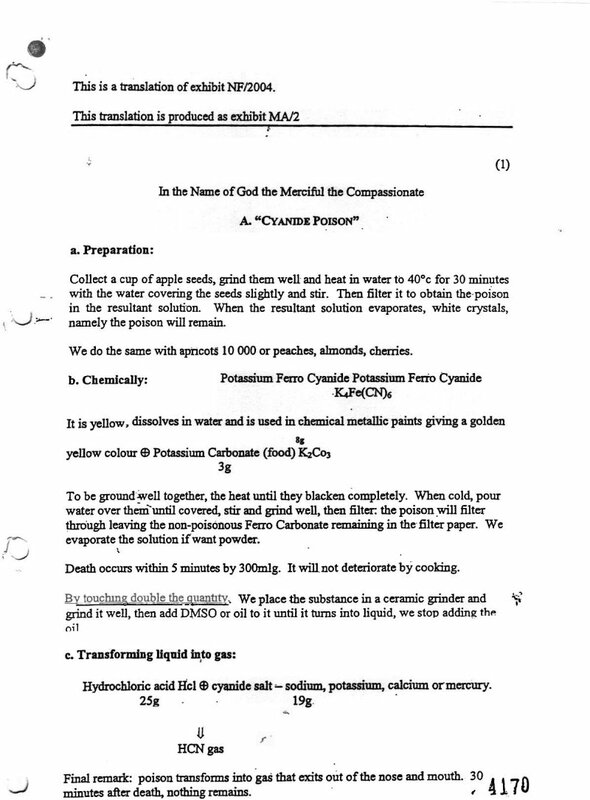 On page 70, Hutchkinson writes, "Mix DMSO with a large amount of ricin ...". 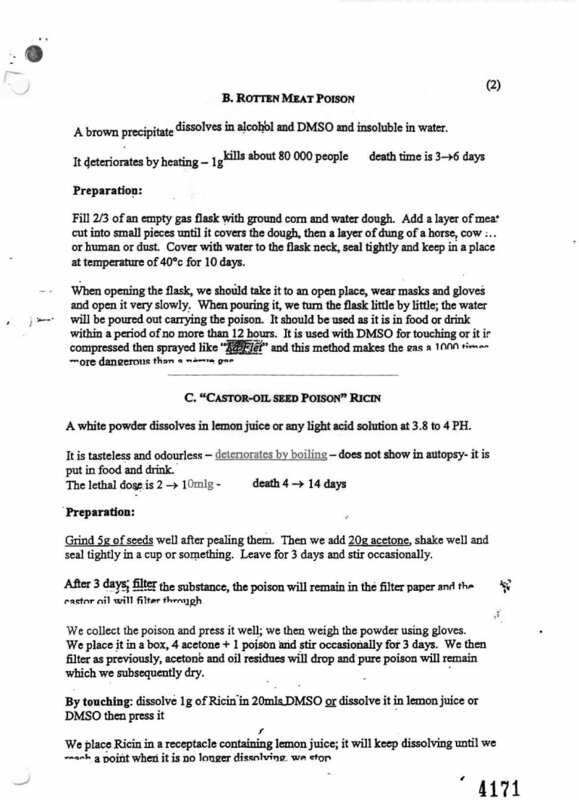 Hutchkinson instructs readers that ricin can be used to poison people who touch things ricin has been sprayed upon. In any case, scientific experts in the Bourgass trial dismissed ricin as a contact poison. The Bourgass trial's "potato poison" recipe lives in the same ninny's library as "rotten meat poison." Heat four pounds of potatoes in rubbing alcohol in your home to get "solayene." The unknown author means -solanine-. With these recipes, the public was fed the story of a shadow conspiracy linked to al Qaida, in the United States, al Zarqawi and Iraq. The menace was said to be real and very credible. The danger was to thousands, as British authorities would state over and over. With everyone in the dark about the nature of the poison recipes, and unaware that no ricin had been found, that story seemed plausible. However, the Bourgass notes on poisons, when seen directly, are too ridiculous to use as part of even a very small plank in Colin Powell's presentation on why the United States had to go to war with Iraq. Realistically interpreted, the recipes are the mark of a moron. The UK government tried to tie them to al Qaida by use of documents seized in Afghanistan and a manual obtained in Manchester. It could not. Expert witness for the defense Duncan Campbell successfully proved this was not true and that identical copies of the recipes could be found on Yahoo computers in Palo Alto, California. Complicating matters was the blundering at Porton Down. In the April 11 issue of National Security Notes, it was explained that Porton Down science had shown no ricin was found in a mortar and pestle at Wood Green but that screw-up had resulted in the report of just the opposite. Now it is obvious that the UK government spared no expense when getting the story out about terror conspiracy and ricin found. However, when the record on ricin was found to be in error, no commensurate effort was taken to publicly inform. The news was too inconvenient. Kamel Bourgass was a very bad man, a murderer, someone who should be locked up for life. But in the matter of poisoning by home chemistry, he was a half-wit. Essentially, he was convicted of being so when found guilty of conspiracy to create a public nuisance with poisons but hung on whether or not he was guilty of conspiracy to commit murder with the same. With the Bourgass recipe evidence and its interpretation as intelligence from the war on terror, there was no lucid or critical analysis. The received wisdom on the subject was that the poison recipes were evidence of al Qaida training and that they posed a very serious threat. This reading spread fear and hysteria when just the opposite should have happened. A less heated appraisal of the capability as displayed in the Bourgass notes would have gone a long way in reassuring the public by providing the assessment that it was hare-brained work. Final lessons from the Bourgass trial are ugly ones. The results of the trial combined with the public delivery of assertions after it demonstrate that the verdicts were not acceptable to power. Although no ricin was found, that was because it had been taken away before authorities arrived. If the jury would not convict Bourgass's co-defendants of conspiracy in a ricin plot, it did not matter because Mohamed Meguerba had said otherwise and this could be used again to impeach them in public. In the United States, three alleged terror suspects being held for trial in Britain were indicted on US charges last week. Mark Hosenball wrote in a Newsweek web exclusive that the UK trial "dismayed U.S. counterterror specialists who were convinced that Bourgass and his four codefendants were in fact acting as part of a broader international terror plot."